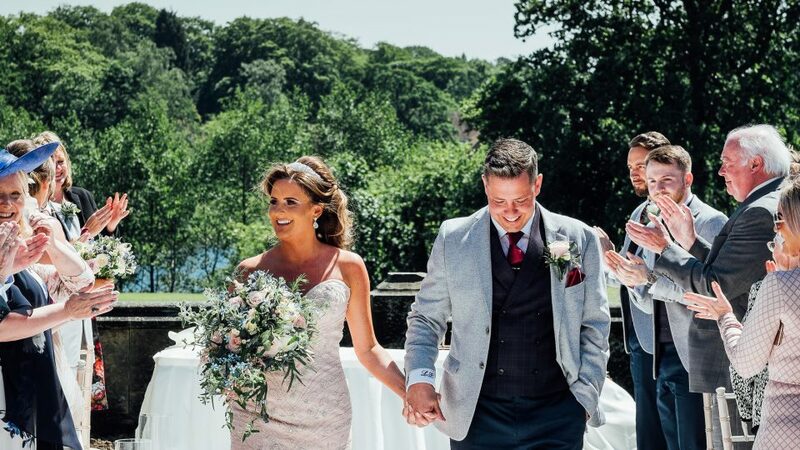 Both Becky and Graeme dreamed of a wedding venue not local to their hometown of Lincolnshire, so that they could combine the day with a mini getaway for friends and family. They married at St. Oswalds Church in Lower Peover, followed by a Champagne and Sparkle themed wedding reception here at The Mere. Plenty of personal touches ensured her guests were welcomed in a truly bespoke way. Personalised hangers for the bridal party made for unique keepsakes from the day, and guests were kept up to speed with the mini newspaper favours containing articles about the engagement, the bridal party, and funny stories about the couple. Guests were welcomed with a Champagne reception, and entertained by a swing singer to keep the party going. Married guests reminisced as their first dance songs came on the playlist, reinforcing the romantic theme Becky had dreamed of. For a unique twist, the couple hired a mobile cocktail bar with flair bartenders to keep the drinks fancy and flowing. The Bride and her Bridesmaids also treated guests to a surprise dance routine, which had been carefully rehearsed wtih a professional choreographer during her Hen Weekend. Becky says there are so many memories from the day, though her ultimate favourite was the first look with her Dad. Needless to say, Team Mere are thrilled to see Becky and Graeme’s wedding in the final for Wedding of the Year, and think the newlyweds truly deserve the title thanks to their creativity and elegant wedding planning skills. Thanks to Vince Green at Red Pepper Studios for sharing his beautiful shots.